Click on the map below to view the national pilgrimage sites. Return here by clicking the 'Sites' icon. The most spectacular destination was, of course, the Holy Land, where the pilgrim would literally walk in the footsteps of Jesus. Christians had travelled to Palestine already during the 3rd century for this very purpose. During the early Middle Ages pilgrimages of this kind gained in popularity, even if it was still only a possibility for a few people. This was because a journey of this kind was an expensive enterprise, and partly because the Holy Land became less accessible, due to the Arabic expansion. The second most important city was Rome, the city of Peter and Paul, with countless graves of martyrs. Through a well-planned strategy by the Pope, the popularity of Rome as the most important destination for a pilgrimage eventually grew. 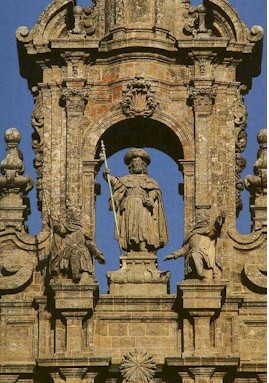 But even if Rome and the Holy Land were of a higher status, the destination that involved the most pilgrims during the Middle Ages was Santiago de Compostela in Spain. 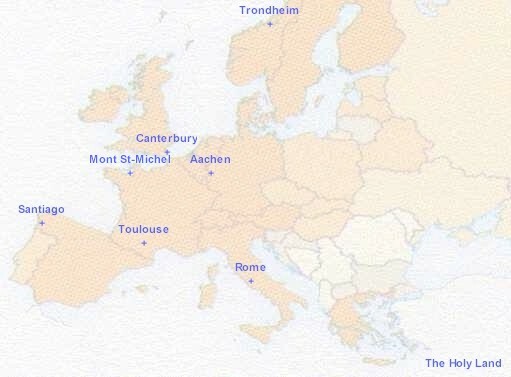 Some other important international destinations for the pilgrimages were Canterbury, Köln (Cologne) and Aachen (Aix-la-Chapelle). Nidaros (Trondheim) in Norway was the fourth most common destination for medieval pilgrims.